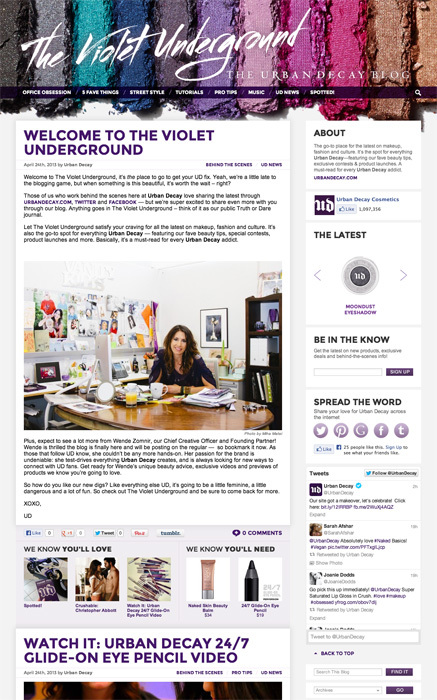 Prior to migrating their blog to Tumblr, I had the privilege of working with a brand I’m a huge fan of — Urban Decay — to turn their design for their blog, The Violet Underground, into a custom WordPress theme. Each post was integrated with custom product fields and there are custom formatting shortcodes for things like testimonials & promo codes. The sidebar also featured a section that remains fixed once reaching a certain pixel point.